Please refer to our stock # 11170 when inquiring. This stunning cuff bracelet was made for the couture collection of Andrew Gn. The Singaporian born designer has worked for Emanuel Ungaro and now works under his own private label produced in France. This beautiful cuff is 3 1/2" wide in front with a 5 1/8" end to end measurement and 1 3/8" gap opening. 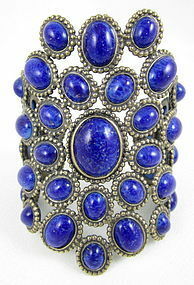 It is made from antiqued gold tone metal and has vintage Czech glass cabochons resembling Lapis Lazuli. It is in excellent condition and is signed "Andrew Gn Paris" on the reverse.